Yes, you can eat breaded chicken on a low carb KETO diet! Keto Chicken Parm, with a crunchy and super delicious pork rind and Parmesan cheese 'breading' is out of this world amazing y'all! I'm not a fan of pork rinds, but when used as a breading it totally works. I like it better than traditional Chicken Parm! Now that's saying something! Obviously, my recipes aren't all low carb, keto approved. We do love our pizza and donuts, after all! But the truth is, dinner at our home is typically low in carbs and keto approved. Mostly because it's just easy to pair a protein, such as flank steak or chicken thighs, with a salad for a quick weeknight dinner. I do also believe, for us, limiting our carb intake any way we can is a good idea, especially seeing as we love our sweets and pasta! Don't get me wrong. I understand how a low carb, keto diet works by strictly limiting carbs to put your body into ketosis in order to burn stored fat, but I like to fool myself into thinking it helps just a little when we at least try to keep the carbs at bay. 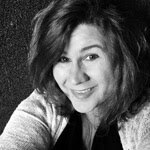 I call it KETO-ish <smile>. For this reason, I'll occasionally share low carb, keto recipes like this Chicken Parm. When I had a craving for chicken parm recently, I wondered how I could reduce the carbs to make a Keto Chicken Parm. That's when I found this recipe recipe on allrecipes and decided to give it a try. Although, I tweaked the recipe slightly, we really liked it! A LOT! To say I was skeptical about using pork rinds to 'bread' the chicken for my Keto Chicken Parm is an understatement! I mean, y'all, I am not a fan of pork rinds! I would never buy a bag of pork rinds and pop them in my mouth for a snack. They taste like little balls of grease to me. Yuck! To me, pork rinds are just nasty to eat alone, but I found grinding them up to bread chicken is a real winner! Seriously! The pork rind and Parmesan 'breading' on the chicken was the best ever! I could eat that chicken even without the marinara sauce and oooey gooey cheese melted on top! I love the pork rind breading so much I used it to make pan fried fish for fish tacos. Mind blown! I'll definitely be making my pork rind crusted fish tacos again too! We love pasta with our chicken parm. I couldn't imagine eating chicken parm without pasta, but how on earth can I add my favorite pasta to a dish and still call it KETO?! I can't! I'm not a magician, right?! So I had to find a low carb, keto alternative to pasta. Zoodles to the rescue! 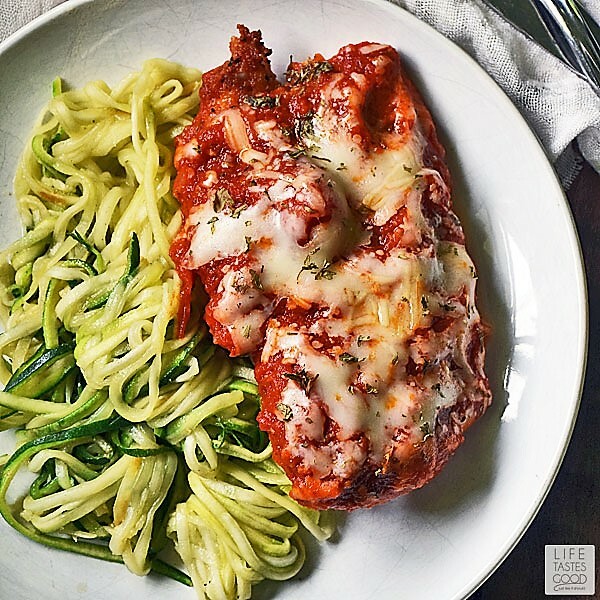 To keep this Keto Chicken Parm recipe low carb, I chose to use zucchini noodles (zoodles) as a low carb alternative to pasta. 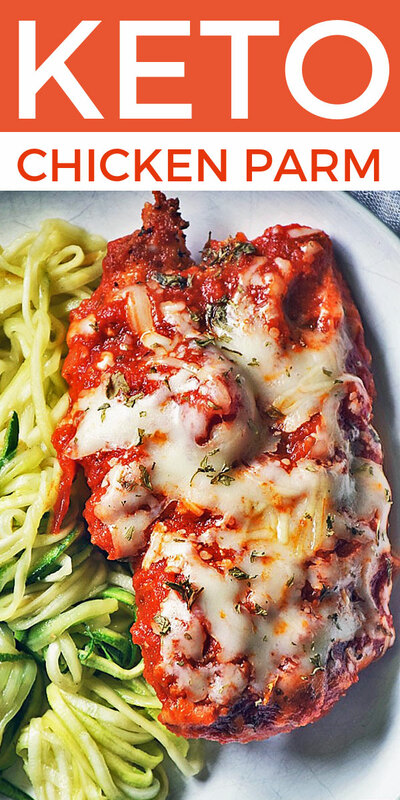 Zoodles are defintiely not pasta, but they are still delicious alongside this Keto Chicken Parm. As a matter-of-fact, I really didn't miss the pasta at all. Sure the taste and texture is different, but it's not bad AND, as it turns out, zoodles are EASIER and FASTER to prepare than pasta. I LOVE zoodles sauteed in garlic butter! Yum! What is Ghee and why do I use it? To put it simply, Ghee, aka liquid gold, is a form of clarified butter. Butter is made up of butterfat, water, and milk solids. Milk solids are the reason butter burns easier than other oils. When you clarify butter, you remove all the milk solids and water to get to the pure butterfat. 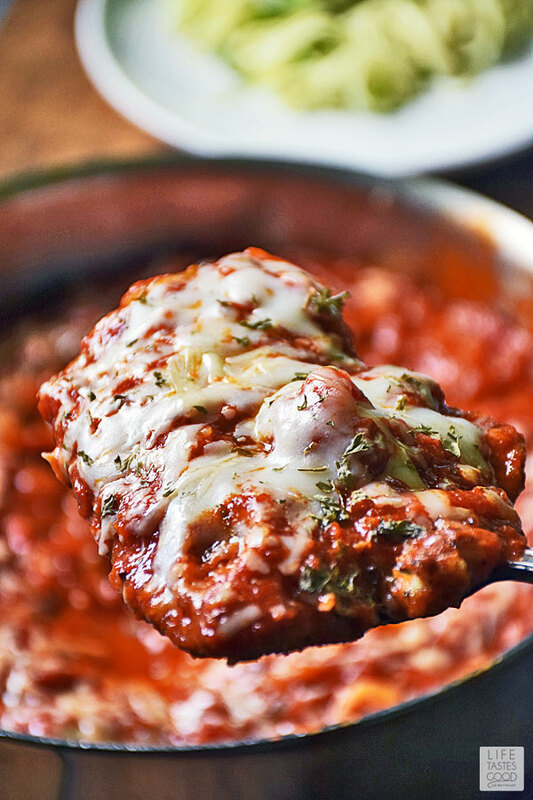 Removing the milk solids creates a higher smoke point, which makes ghee ideal for pan frying recipes such as this Keto Chicken Parm and many others. I love using ghee in my Pan Seared Sirloin Steak Dinner for Two recipe as well. You can make ghee at home, but for convenience I find it ready-made at my grocery store on the shelf near the butter. Gather all of your ingredients together first and prep everything before you actually start making the recipe. I recommend doing this anytime you cook. It makes actually doing the cooking so much easier. For example, crush the pork rinds and combine with cheese and seasonings for breading, whisk up the egg mixture, set up the breading station, slice the chicken breasts in half and pound to 1/2" thickness, spiralize the zucchini, and mince the garlic to have everything ready to go. I like to only use one skillet when making this recipe, so I cook the zoodles first and then keep them warm until ready to use. 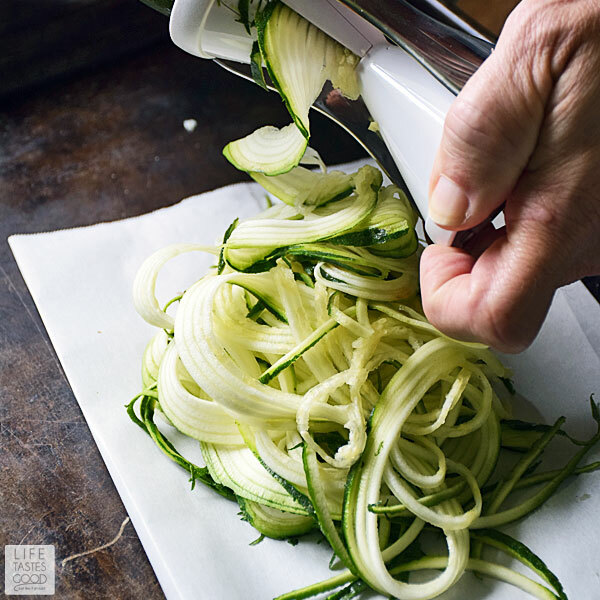 To make the zoodles, melt 1 tbsp butter in the skillet over medium heat and add 1/2 tbsp minced garlic, the zoodles, and a pinch of salt. Saute until the zoodles start to soften. I like my zoodles a little crunchy, but definitely cook them how you like them. Remove the zoodles from the skillet to a plate and cover with foil to keep warm until ready to use. Dip chicken breasts into egg mixture to coat completely and then dredge the chicken in the crushed pork rind mixture. Being sure to coat both sides of each chicken breast completely. Press down slightly on the chicken to make sure the breading is sticking. Line a baking sheet with foil or parchment paper and place the coated chicken breasts on the baking sheet until all chicken is coated and ready to cook. Using the same skillet on medium heat add 2 tbsp ghee. Place 2 of the breaded chicken breasts in the skillet and cook for about 3-4 minutes each side until no longer pink in the center and the juices run clear. Use an instant read thermometer to ensure the chicken is cooked to 165°F. Be sure to to cook the chicken fully as consuming raw or under cooked chicken is dangerous. 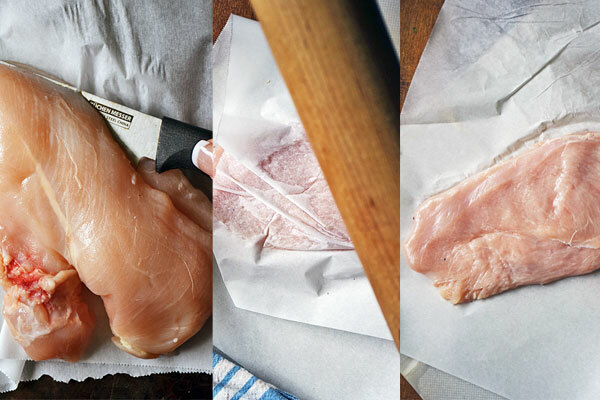 Transfer the cooked chicken to a plate and repeat the cooking process with the remaining 2 chicken breasts. If needed, add more ghee to the skillet to cook the remaining 2 chicken breasts. When all of the chicken breasts are fully cooked, return them to the skillet and add the marinara sauce. Top with cheese and put the lid on the skillet. Cook until the cheese is melted. 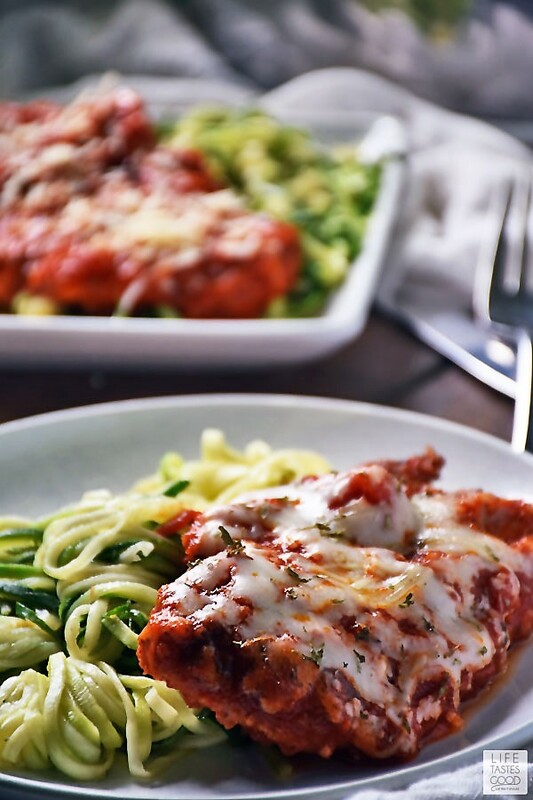 Serve the Keto Chicken Parm with the zoodles garnished with freshly chopped basil. Enjoy! Most home cooks will already have many of the tools needed to make this recipe. I think the most unique cooking tool you might need is a spiralizer. I have a really inexpensive one and linked it for you below. Alternately, many grocery stores are selling spiralized zucchini in the produce section, which is super convenient! Below is a list of tools I use when making my Keto Chicken Parm recipe. Just click on the item name and find the product I use on Amazon. Keto Chicken Parm, with a crunchy and super delicious pork rind and Parmesan cheese 'breading' is out of this world amazing y'all! Melt 1 tbsp butter in skillet over medium heat. Add 1/2 tbsp minced garlic, zoodles, and a pinch of salt. Saute until zoodles start to soften. 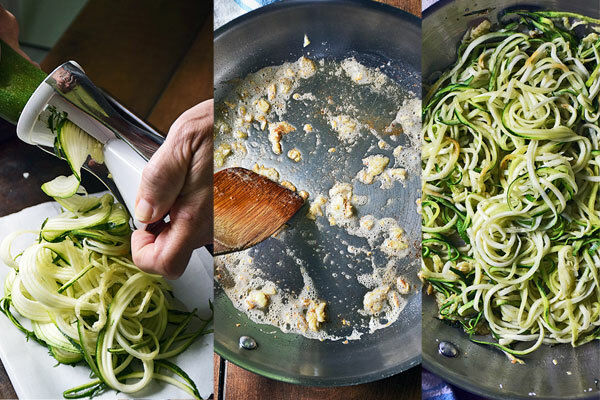 Remove zoodles from skillet to a plate. Cover with foil to keep warm until ready to use. In a container big enough to dredge the chicken, combine 2 1/2 ounces crushed pork rinds, 1 1/2 ounces grated Parmesan cheese, 3/4 tsp kosher salt, 3/4 tsp garlic powder, 3/4 tsp Italian seasoning, and 1/4 tsp red pepper flakes. Mix well. 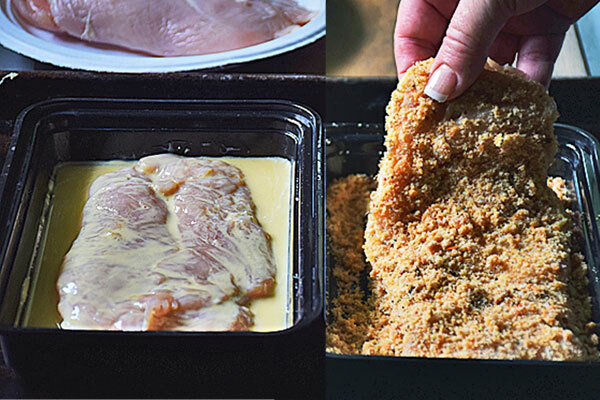 One at a time, dip the 1/2" thick chicken breasts into egg mixture to coat both sides completely and then dredge chicken in crushed pork rind mixture. Being sure to coat both sides of each chicken breast completely. Press down slightly on the chicken to make sure the breading is sticking. Place on baking sheet lined with parchment paper. Heat skillet on medium heat. Add 2 tbsp ghee. Place 2 breaded chicken breasts in skillet and cook for about 3-4 minutes each side until no longer pink in center and juices run clear. Use an instant read thermometer to ensure chicken is cooked to 165°F. Be sure to to cook the chicken fully as consuming raw or under cooked chicken is dangerous. Transfer the cooked chicken to a plate and keep warm. Repeat the cooking process with remaining 2 chicken breasts. If needed, add more ghee to skillet. When all chicken breasts are fully cooked, return them to the skillet and add 1 cup marinara sauce. Top with 1/4 cup Mozzarella cheese and put lid on skillet. Cook until the cheese is melted. 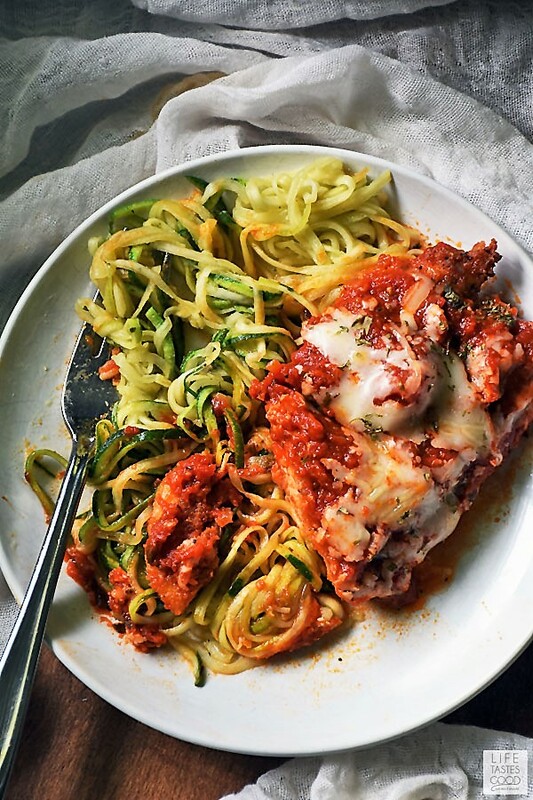 Serve the Keto Chicken Parm with zoodles garnished with freshly chopped basil. Enjoy!